Since 2016, a “1-inch Type” sensor size now optimizes the portability of serious travel cameras (recommended here). In comparison, cameras using larger APS-C sensors require heftier 11x to 19x travel zoom lenses which struggle to sharpen the edges of the frame. Cameras using even bigger full-frame sensors restrict zoom ranges and overburden most travelers. Sensors smaller than “1-inch” size can support super zoom ranges, but at the cost of poor image quality, especially in dim light. Smartphones compensate for tiny cameras via computational power and instantly-shareable images, but zoom poorly and fumble in dim light. The archaic inch-sizing of camera light sensors is clarified in the illustration and table below, with relative sizes and millimeters. Legacy sizing labels such as 1/2.5″ Type harken back to antiquated 1950s-1980s Vidicon video camera tubes! For a given year of technological advance, a camera with physically bigger sensor area tends to capture better image quality by gathering more light, but at the cost of larger-diameter, bulkier lenses. Recent digital sensor advances have shrunk cameras and increased optical zoom ranges while preserving image quality. An evocative image can clearly be created with any decent camera in the hands of a skilled or lucky photographer. Top smartphone cameras can potentially make good 18-inch prints and share publishable pictures. But I recommend a bigger camera for superior optical zoom, better performance in dim light, and sharper prints. This illustration compares digital camera sensor sizes: full frame 35mm (which is actually 36mm wide), APS-C, Micro Four Thirds, 1-inch, 1/1.7″ and 1/2.5” Type. For new digital cameras, a bigger sensor area captures better quality, but requires larger-diameter, bulkier lenses. As of 2018, 1-inch Type sensors optimize the size of a serious travel camera. “Full-frame 35mm” sensor (36 x 24 mm) is a standard for comparison, with a diagonal field-of-view crop factor = 1.0; in comparison, a pocket camera’s 1/2.5” Type sensor crops the light gathering by 6.0x smaller diagonally (with a surface area 35 times smaller than full frame). Click here for Tom’s latest camera recommendations. The best & brightest pocketable zoom camera is Sony Cyber-shot DSC-RX100 VI (at Amazon) (2018, 11 oz, 8x zoom 24–200mm f/2.8-4.5) — my new backpacking camera. Read my RX100M6 review. Cheaper alternative: Panasonic LUMIX ZS100 camera (Amazon) (2016, 11oz, 10x zoom, 25-250mm equivalent, 20mp). The pocketable ZS100 (read my review) is not as sharp as the 3x-zoom Sony RX100 V, IV or III cameras, but captures close macro at more zoom settings and enormously extends optical telephoto reach 70-250mm, which clearly beats digitally cropping those 3x-zoom rivals. Capturing 20 high-quality megapixels, both the Panasonic ZS100 and superior Sony RX100 version VI rival the daylight image quality of all my camera systems used over 34 years until 2012 (beating my cameras up to 4 times heavier, up to 11x zoom range, up to 12 megapixels, shot at base ISO 100). My main camera: Sony RX10 IV (price at Amazon) (2018, 37 oz, 25x zoom) is the world’s most versatile midsize camera for on-the-go photographers (read my RX10 IV review). Sony A6300 (read my article). Nikon D3500 mounted with versatile Tamron 16-300mm f/3.5-6.3 Di II VC lens is a good-value 32-ounce DSLR travel system. If you are considering one of the excellent cameras with Micro Four Thirds sensor, consider that the Sony A6xxx camera series is nearly as compact yet collects more light onto a larger APS-C sensor. Also older models save mucho money. The next step up to full-frame-sensor cameras costs extra, adds bulk, and is only needed if you regularly shoot in dim light higher than ISO 6400 (such as for indoor action), or often print images larger than 2 or 3 feet in size (to be viewed closer than their longest dimension by critically sharp eyes), or specialize in night photography. But there’s no need to go overboard. Let’s put this in perspective: huge effective billboards can be printed from small 3-megapixel cameras (read my article). My CAMERAS article updates Light Travel camera recommendations several times per year. If possible, compare cameras shot side-by-side under a variety of actual field conditions (which I do just before selling a former camera to confirm the quality of the new replacement camera). I like to “pixel-peep” a side-by-side comparison of two different cameras capturing the same subject under same lighting conditions in the field. Be sure to mentally or digitally normalize any two given shots to compare their fine detail as if printed with equal overall image size. I judge image quality and resolution not by megapixel (MP) count but instead by comparing standardized studio test views at 100% pixel enlargement. Check resolvable lines per picture height (LPH) at the authoritative dpreview.com (owned by Amazon since 2007) and handy Comparometer at imaging-resource.com. Check other review sites analyzing a camera’s telephoto in addition to standard lens. Yearly advances of 2014-16 put the sweet spot for serious travel cameras between 1”-Type and APS-C size sensors. Then from 2016-2018, camera designs using 1”-Type sensors surpassed the portability of APS-C offerings. Most cheaper compact cameras have smaller but noisier sensors such as 1/2.3″ Type (6.17 x 4.56 mm) — tiny enough to miniaturize a superzoom lens, but poor for capturing dim light or for enlarging prints much beyond 12-18 inches. Smartphones can have even tinier sensors, such as 1/3.0″ Type (4.8 mm x 3.6 mm) in Apple iPhone versions 5S through 8. Remarkably, top smartphone cameras have improved miniature sensors to the point where citizen journalists can capture newsworthy photos with image quality good enough for fast sharing and quick international publication. The best cameras are in the latest Google Pixel, Samsung Galaxy, and Apple iPhones. My former Samsung Note5 smartphone (same camera as in S6 & S7 with 1/2.6″ sensor) captures sunny 16-megapixel images sufficient to make a sharp 18-inch print, virtually indistinguishable from that taken by a larger camera. Smartphone tips: To isolate subjects, avoid the digital zoom on smartphones, which records extra pixels without adding quality. Instead move closer before shooting, or crop at editing time. Use your phone’s 2x telephoto camera (~50mm equivalent lens), if any. Tiny subjects can be enlarged best at close focus using the 2x tele lens, as on Samsung Galaxy S9+ or my Note9. Read this pointed perspective on how far image quality has progressed from early DSLR to 2014 smartphone cameras. Historically, evocative images can clearly be captured regardless of camera size or modernity. But for a given year of technological advance, tiny-sensor cameras can have severe limitations compared to physically larger cameras in terms of print enlargement, autofocus speed, blurred performance in dim/indoor light, and so forth. The “best” travel camera is the one that you are willing to carry. * Crop Factor: Note that a “full frame 35mm” sensor/film size (about 36 x 24 mm) is a common standard for comparison, having a diagonal field of view crop factor of 1.0. The debatable term crop factor comes from an attempt by 35mm-film users to understand how much the angle of view of their existing full-frame lenses would narrow (increase in telephoto power) when mounted on digital SLR (DSLR) cameras which had sensor sizes (such as APS-C) which are smaller than 35mm. With early DSLR cameras, many photographers were concerned about the loss of image quality or resolution by using a digital sensor with a light-gathering area smaller than 35mm film. However, for my publishing needs, APS-C-size sensor improvements easily surpassed my scanning of 35mm film by 2009. 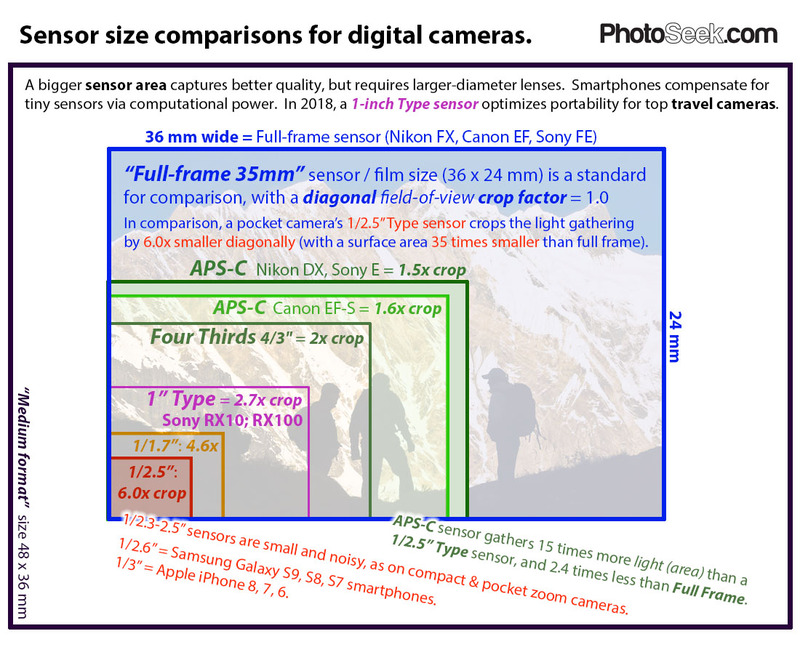 An interesting number for comparing cameras is “Full frame sensor area is x times bigger” in the above table. In comparison to full a frame sensor, a pocket camera’s 1/2.5-inch Type sensor crops the light gathering surface 6.0 times smaller diagonally, or 35 times smaller in area. An APS-C size sensor gathers about 15 times more light (area) than a 1/2.5” Type sensor and 2.4 times less than full frame. APS-C sensors in Nikon DX, Pentax, and Sony E have 1.5x diagonal field of view crop factor. APS-C sensors in Canon EF-S DSLRs have 1.6x diagonal field of view crop factor. 1 stop is a doubling or halving of the amount of gathered light. Doubling a sensor’s area theoretically gathers one stop more light, but depends upon lens design. For improving image quality, the quality and diameter of the lens can rival the importance of having a physically larger sensor area. Prime (non-zoom) lenses usually are sharpest for larger prints, but zoom lenses are more versatile and recommended for travelers. In my side-by-side field tests, the sharp, bright 25x zoom of Sony RX10 III (read my version IV review)resoundingly beats the resolution of 11x SEL18200 lens on flagship APS-C Sony A6300 at 90+ mm equivalent telephoto, even as high as ISO 6400. (Wider angle zoom settings show little quality difference.) Apparently RX10’s faster f/2.4-4 lens plus backside illumination (BSI) technology magically compensate for the sensor size difference, 1″-Type versus APS-C. Like most APS-C-sensor cameras in 2016, A6300 lacks BSI. Surprisingly little noise affects RX10’s image quality at high ISO 6400 in dim light. Its larger lens diameter gathering more light also helps in this comparison (72mm filter size of RX10 III versus 67mm SEL18200 on A6300). In my field tests, the linear sharpness of Sony’s high-quality SEL1670Z 3x zoom f/4 lens on flagship A6300 is only about 5% better than Sony RX10 III f/2.4-4 in bright light in the wider half of its 24-105mm equivalent range, but no better in dim light. I expect that RX10’s catch-up in quality under dim light is due to superior light sensitivity of BSI sensor plus larger lens diameter gathering more light, 72mm versus 55mm. In principle, you might expect a slightly sharper image on an APS-C sensor when using the sweet spot of a lens designed for a full frame (which has a larger imaging circle), but results actually vary, especially when using older film-optimized lenses. In fact, a lens which is designed and optimized specially “for digital, for APS-C” can equal or exceed the quality of an equivalent full-frame lens on the same sensor, while also reducing bulk and weight (as in the Sony E-mount example further below). Unlike film, digital sensors receive light best when struck squarely rather than at a grazing angle. Digital cameras perform best with lenses optimized specially “for digital”, using image-space telecentric designs, in which all the rays land squarely on the sensor (as opposed to having incoming rays emerge at the same angle as they entered, as in a pinhole camera). The light buckets (sensels) on digital sensors require light rays to be more parallel than with film (to enter at close to a 90 degree angle to the sensor). Film can record light at more grazing angles than a digital sensor. Because older film-optimized lenses bend light to hit the sensor at more of a glancing angle, they reduce light-gathering efficiency and cause more vignetting around the edges (which is somewhat mitigated by the image circle being cropped by the APS-C sensor, which uses just the center part of the full-frame lens). 2015 full-frame “Sony E-mount FE 24-240mm f/3.5-6.3 OSS” lens (27.5 oz, 36-360mm equivalent). 2010 APS-C “Sony E-mount 18-200mm f/3.5-6.3 OSS (silver SEL-18200)” lens (18.5 oz, 27-300mm equiv). Both lenses are optimized for digital, yet the APS-C lens is much lighter weight and performs equal to or better than the full-frame lens. Side-by-side comparisons and also DxOMark tests on a Sony A6000 camera show that while they are about equally sharp, the Sony 24-240 has more distortion, vignetting and chromatic aberration than the 18-200mm. For a given angle of view, cameras with larger sensors can achieve a shallower depth of field than smaller sensors, a feature which movie makers and portrait photographers like to use for blurring the background (at brightest aperture setting, smallest F number value) to draw more attention to the focused subject. Conversely, smaller-sensor cameras like the Sony RX10 III and RX100 III tend to be much better at capturing close-focus (macro) shots with great depth of field (especially at wide angle), at ISO up to 800. But the macro advantages of small-sensor cameras can diminish in dim light or when shooting at ISO higher than 800. Landscape photographers often prefer to capture a deep depth of field, which can be achieved with both small and large sensor cameras. Optimal edge-to-edge sharpness usually occurs when stopping down the aperture once or twice from brightest opening, such as between f/4 to f/5.6 on 1-inch Type sensor, or between f/5.6 to f/8 on APS-C (which also helps diminish chromatic aberrations). Stopping down further with f/numbers larger than this increases depth of field, but worsens diffraction through the smaller pupil opening (such as at f/11-f/16 on 1″ sensor or f/22 on APS-C), noticeably softening detail. To maximize raw dynamic range of brightness values from bright to dark, use base ISO (around ISO 100 or 200 in most digital still cameras), rather than higher ISO settings which amplify noise (blotchiness at the pixel level, most-visibly in shadows). However, using the latest full-frame sensors at high ISO values 6400+ can capture unprecedentedly low noise and open new possibilities for dim-light action photography at hand-held shutter speeds, indoors or at night. Without the help of a flash, night and dim indoor photography is best with a full-frame sensor to gather more light with less noise. Low-noise night photography is usually best shot on a tripod at slow shutter speeds in raw format between ISO 100 and 800 (or as high as 1600-3200 on the latest large sensors). For a given year of technological advance, cameras with larger sensors typically capture a wider dynamic range of brightness values from bright to dark per image than smaller sensors, with less noise. In 2016, Sony’s 1″-Type backside illumination (BSI) sensors capture sufficient dynamic range for my needs. Camera raw format allows editing recovery of several stops of highlight and shadow detail which would be lost (truncated) in JPEG file format (if overexposed or underexposed). Alternatively, PC software or camera firmware using HDR (High Dynamic Range) imaging lets any size of sensor greatly increase an image’s dynamic range by combining multiple exposures. But for me, the great dynamic range of a single raw file (from 1″-Type BSI or APS-C sensor) usually makes shooting extra images for HDR unnecessary. Despite advanced circuitry, cameras are not smart enough to know which subjects are supposed to be white, black, or midtone in brightness. By default, all cameras underexpose scenes where white tones (such as snow) predominate, and overexpose highlights in scenes where black tones predominate. IMPORTANT TIP: To correctly expose for all tones, you need to lock exposure upon a perceived midtone (such as a gray card; or on a line halfway between light and shadow) in the same light as your framed subject. For greatest editing flexibility, rather than shooting JPEG format, serious photographers should record and edit images in raw format, which is supported in advanced cameras (but often not in small-sensor devices). Editing raw format fully recovers badly-exposed images − allowing you to “point and shoot” more freely than with JPEG. Even so, I carefully shoot to expose each histogram to the far right while avoiding truncation of highlights, in order to capture the highest signal-to-noise ratio in each scene. Try to stay close to base ISO 100 or 200. I typically first shoot a test shot on automatic Aperture-preferred priority, inspect the histogram, check any blinking highlight warnings, then compensate subsequent shots using Manual Exposure (or temporary Exposure Lock grabbed from the scene). Tonal editing of JPEGs can quickly truncate color channels or accumulate round-off errors, often making the image appear pasty, pixelated, or posterized. White Balance (Color Balance) is easily adjustable after shooting raw files, but tonal editing often skews colors oddly in JPEG. 12-bit Raw format has 16 times the tonal editing headroom and color accuracy compared to JPEG (which has only 8 bits per pixel per red, green, or blue color channel). In their favor, automatic point-and-shoot JPEG camera exposure modes get smarter every year, making advanced larger cameras less necessary for many people. Despite its tinier but denser photosite buckets (also called sensels or pixel wells for catching light photons), the 36 MP Sony Alpha A7R beats the dynamic range of 12 MP Sony Alpha A7S in a normalized comparison of raw files (see dpreview article). While both cameras spread their photosites across the same surface area of a full-frame sensor, the 36 MP A7R trumps the 12 MP A7S for exposure latitude flexibility in raw post-processing at ISO 100 through 6400. Overall image quality of the 12 MP A7S doesn’t beat the A7R until ISO 12,800 and higher (but only in the shadows through midtones under low-light conditions). Sony A7S is better for low-light videographers, whereas A7R is better for low-light landscape photographers who value high resolution and dynamic range. Support my work — buy anything after clicking any Amazon.com product link on PhotoSeek. Still don’t understand this: when my 20x zoom camcorder sony hxr-nx3 with 3x 1/3 inch sensor. Which lens do have to buy for the same “reach” at the tele mode in a apsc sensor? Good question, as standard sensor sizes of video camcorders differ from still cameras. To emulate the zoom angles of view of a Sony HXR-NX3 camcorder, the Sony FS100 camcorder would theoretically need a lens with focal length specs of 20-410mm, which would be “28.8 – 576mm equivalent” in terms of angle of view (assuming FS100 has ~1.4 “crop factor”). Such a lens doesn’t exist for Sony e-mount. Your tiny-sensor Sony HXR-NX3 has a bigger optical zoom (20x, “28.8 – 576mm equivalent”) but captures much less light than your Sony FS100 mounted with an 18-200mm lens (11x, “25 – 280mm equivalent”, assuming 1.4 “crop factor”). Capturing less light can noticeably increase noise and lower image quality, especially in dim conditions. Panasonic FZ2500 (24-480mm equivalent) or Sony RX10M4 (24-600mm equivalent) both which can focus closely with great magnification and have advanced video capabilities. Your Sony HXR-NX3 has three “1/2.8-inch” type sensors to separately capture the red, blue, and green light. The Sony FS100 has a much larger image sensor called “Super 35mm” (23.6 x 13.3 mm), with a diagonal crop factor of around 1.4 to 1.5 compared to “35mm full-frame format equivalent”. “Super 35mm” format is slightly larger than an APS-C sensor. FS100 can capture much shallower depth of focus than the NX3 at a given aperture f/stop, for a given angle of view. Your 18-200mm zoom lens on FS100 is “25 – 280mm equivalent” (assuming a crop factor of 1.4). In comparison, NX3’s 20x zoom has a more powerful telephoto, at “28.8 – 576mm equivalent”. For the same reach on FS100, you would theoretically need a 20-410mm lens. Thank you so much for this long answer! I really appreciate this! A 410mm is huge for a APSC lens. There is a 100-400mm lens for emount but this for full frame and very expensive. I have a nikon 70-200mm F2.8 full frame but this only a manual lens. So manual focus with peaking function and zooming is also not easy. (bought it very cheap) I uses a dumb adapter for this. I shoot mostly theatre shows, communion in a church, dance performances,… So I need that zoom range. The 1 inch sensor camcorders. I know them but I want this in a bigger body. At this moment the panasonic HC-X1 with 20x zoom looks interesting price/quality. I don’t need 4K at this moment but not bad futureproof). What I read online and saw on youtube this 1 inch camcorders are not much better in low light than my hxr-nx3. My sony goes wide from F1.6 to F3.4 in telemode. Those 1 inch go from F2.8 to 4.5 in telemode. Ok, you have more resolution and a bit better low light. So I don’t know. Bit confused here. I do this filming in “secondary occupation” Mostly what I shoot goes to dvd (90%) and blu ray (10%). But in post I always sharpen my footage. On my pc screen it doesn’t look that sharp, not bad but not great either. Thx again! Do you know/have a chart about, how the sensor size inside the smartphones increased through time (years). Thank you. The A7S has a Full-Frame 12 MP sensor, while the new BlackMagic 4K Pocket Cinema Camera has a M4/3 sensor, but its only 8 MP. So, If the pixel sizes/ photosite bucket sizes are equal or comparable, the senors size difference should not affect low-light videography, should it? In general, the light capturing ability would depend on the pixel size rather than the sensor size? P.S. Amazing article, I am a fan ! For sure, you can get shallower depth of field with a larger sensor than a smaller one, when using the brighter lenses on a given system (such as f/1.4 to 1.7 on full frame). Shallow depth of field is especially important to most videographers and portrait photographers. Smaller sensors have smaller hole diameters for a given F stop, so their equivalent F number in terms of full frame is in proportion to sensor crop factor. If you don’t care much about shallow depth of focus, a smaller sensor is fine, except in dim light, where it will capture more noise than a larger sensor (all else being equal). As I’m primarily a landscape stills photographer, I prefer the extra depth of field of sensors smaller than full frame (such as 1″ type sensor), especially good for macro/close focus and great portability. A full frame sensor has a light collecting surface area that is 3.8 times larger than micro four thirds (theoretically capturing nearly 2 stops less noise in terms of ISO sensitivity, all else being equal). All else being equal (such as year of technological advance, photosite bucket sizes & density, sensitivity of photosites, sophisticated design such as stacked backside illumination BSI, noise handling algorithms, processing sophistication, lens diameter and brightest aperture, lens sharpness, good glass, equivalent aperture, shutter speed, ISO setting, etc), the sensor with the physically larger surface area will collect more light, which if fully and properly processed, will yield more noise-free information than a smaller sensor, for theoretically better low-light performance. A7S mark II “has rolling shutter issues during movement of the camera; 4K at only 30fps; 3″ monitor; can only shoot 8 bit raw with added pricey external gear.” $2200 plus lenses. In comparison, BlackMagic 4K Pocket Cinema Camera (news release) can conveniently shoot 12 bit raw and has no rolling shutter issues. $1300 (plus Micro Four Thirds lenses) is “cheap enough to take a chance on” for professional video production. It has a big 5″ touchscreen with 1920×1080 resolution, captures “13 stops of dynamic range,” and is smaller and lighter-weight than full frame cameras. A raw file format workflow is extremely important for video (and of course for stills, I will strongly attest), and is much more easily and cheaply achieved with the new BlackMagic 4K. But watch out for “overheating problems, card writing errors, software glitches” which have been reported on earlier versions of BlackMagic cameras. Luckily BlackMagic has now switched to a Canon battery, and it remains to be seen if that helps, says another reviewer. APS-H format has a sensor size of 28.7 x 19mm and crop factor 1.3x, used on the following cameras: Canon EOS 1D Mark IV, Canon EOS 1D Mark III, Canon EOS 1D Mark IIN, Canon EOS 1D Mark II, Canon EOS 1D. Canon discontinued APS-H in 2011 (after announcing the full-frame EOS-1D X camera). Hi! I own both a full frame size sensor camera, EOS D5 and an APS C-size EOS D50. Here’s my question: will a 200 mm image from a full frame size sensor be of the same quality as a 200 mm image that has been achieved through conversion or lens equivalence determination taken with APS C-size sensor camera? A small 200mm (8-inch) print is unlikely to distinguish between the Canon EOS 50D and 5D. But for significantly larger prints (such as 500mm+) made from an image taken under identical lighting and similar lens quality shot on a tripod, I’d expect the larger sensor in 5D to capture visibly better quality. Since you own both cameras, simply testing will give your final answer. Significantly affecting this comparison is that the Canon EOS 50D has 15 megapixels, whereas Canon EOS 5D cameras come in four different versions: 5D Mark I is 13 megapixels; 5D Mark II is 21 MP; 5D Mark III is 22 MP; and 5D Mark IV is 30 MP as released in 2016. Using lenses of different quality (such as prime versus zoom) will also affect comparisons. Compare Canon 5D resolution in this Review at dpreview which has an “Image size > Print” comparison option (selecting 5D Mark IV or III or II or I, versus EOS 70D with 20 MP, but they haven’t tested the 50D). Your own testing will be more definitive. Tom this article is a marvelous source of information…and I thank you for your efforts. I’m thinking of downsizing from a Nikon D7200 to a Panasonic GX85 and 14-140 lens for travel. Do you think this would be a wise move for a 76 year old man based on quality of photos produced between the two systems? GX85 is a good 16-megapixel portable lightweight system that you are likely to enjoy. Although I prefer 20 MP in 1″ sensor cameras, or 24MP in APS-C (as in lightweight Nikon D5500 or D5600; or Sony A6300/A6500), to provide lots of cropping leeway or print enlargement possibilities if needed, you still only need 3 megapixels to sharply print a highway billboard, if the observer stands at least twice its width away. Image quality is more strongly tied to artistic subject matter and raw editing than to resolution or megapixels. Most any modern camera can capture stunning images, depending upon the artist. Lighter-weight portability is a big advantage of the GX85 & its lenses. Have fun with it! Hello, impressed by your reviews on Sony RX10 iv versatility and wondering how it would compare to the 2x expensive Sony A99 II full sensor utilizing my old Minolta Maxxum 7000 film camera 35-70 & 75-300mm lenses & maybe my old 2800AF flash assuming it also works with the A99 II? I think I’d carry the RX10 iv more often for vacations, car shows, etc. Image stabilization (such as Nikon VR or Sony OSS) is critical for travel photography. The Sony A99 II body has 5-Axis Sensor-Shift Stabilization, so even legacy A-Mount glass can be image stabilized for both for stills and video. The A99’s 42MP BSI CMOS sensor is spectacularly sharp using prime lenses: compare A99 to other cameras at dpreview. A99 looks about 50% sharper than Sony A6500 which in turn is noticeably sharper than RX10iv, especially at ISO 1600+. Your old 2800AF flash may need a possibly-wobbly adapter for A99 II. Using older film-optimized lenses on digital sensors may cause more vignetting and may not be quite as sharp as designed-for-digital lenses, which direct the angle of incidence more perpendicularly to reach the light buckets. But money spent upgrading to digital lenses would be better applied to an RX10iv for travel. Sony A99 II body weighs a hefty 30 ounces, plus bulky full-frame lenses add at least 30-40 ounces, making an overly hefty kit for travel, compared to the world’s most versatile camera, the 37-oz Sony RX10iv. Wow, great response! I think a RX10iv is the way to go… WAY better than an iPhone camera & still portable. The 72mm lens is way bigger than my A-mount lenses that are 55mm & adding $1k lenses to the $3k A99 is more camera than I need. The Nikon CoolPix 900 has a crazy zoom 24-2000mm but I imagine image quality really suffers at high telephoto? I’ve seen a couple of decent big lenses that use iPhone for viewfinder/camera brains so clip on back… any upcoming versions worthy of consideration to be truly portable for travel? Cropping images from the larger-sensor RX10iv at 600mm equivalent should still beat the quality of Nikon CoolPix 900 at 2000mm. Rather than tacking lenses onto the iPhone, I would recommend investing in a pocketable Panasonic ZS100 (or larger camera like Sony RX10iv, since your interest in the huge A99 shows admiration of capturing high quality images). Great article. I am looking at the Sony RX10 iv for a safari in Africa I plan to take in June. Can you explain the pros/cons vs a Nikon D7500 with a Nikon 18-300mm VR AF-S NIKKOR 1:3.5-5.6G ED. I know the spec difference but will one provide better images with more easy? …same thing for the Nikon D500. I know it has the same sensor but it is faster and has improved focus but without Scene modes and flash. Lucky you going to Africa! The Sony RX10 iv will be easier to use and generally sharper than Nikon D7500 mounted with 18-300mm, especially at telephoto. Sony achieves the better performance with a combination of 1-stop brighter lens aperture throughout the zoom range; high quality ZEISS® Vario-Sonnar T* optics; plus more-efficient stacked backside illumination (BSI) sensor technology (not yet available for Nikon APS-C). In very dim indoor or night lighting, Nikon D7500’s larger sensor mounted with 18-300mm may theoretically resolve more detail than RX10 at wide angles of view (not at tele), but not by much. Dedicated night photography is more appropriately the realm of full frame sensor cameras with fast prime lenses, anyway. RX10iv will do great handheld from dawn to dusk; at night use low ISO 100 up to 800 and tripod. Or I like to handhold in dim light, like in a cave or dim museums, using Sony’s Handheld Twilight Mode, which stitches several shots into a JPEG, with several stops less noise than a single shot would have. Otherwise, always shoot raw format for superior editing leeway. Advantageously, RX10 stretches to a wider view of 24mm equivalent. The 18-300 only reaches from 27-450mm equivalent, a 17x zoom, whereas RX10 iv reaches angles of view from 24-600mm equivalent, an impressive 25x zoom, remarkably sharp throughout, considering its portability. Focusing ability through the viewfinder may be roughly similar with the new RX10 iv versus DSLRs like Nikon D7500, except D7500 is better at focus tracking in action shots (which I never use anyway). Nikon D7500 has an optical viewfinder, if you like that kind of thing. Optical viewfinders have an advantage seeing to compose and focus at night, when an EVF is basically black unless you can focus on something brighter in the sky. But I prefer digital, EVF viewfinders, which show the close-to-final digital image continuously as you compose, plus all the shot and playback info desired. Menus behave the same on both EVF and LCD on Sony, but differ in complex ways on D7500, making D7500 harder to remember how to use. RX10 iv has a stunningly large, sharp EVF. Buy extra batteries for the Sony, as it can use power twice as fast. Shooting images using the LCD will be better on RX10 iv than D7500, since most DSLRs focus sluggishly when using an LCD (due to poor contrast detection), forcing you to mostly use the optical viewfinder on DSLRs. The same reasoning applies to D500. Nikon D500 is mainly advantageous for faster sports autofocus with more effective tracking of fast-moving subjects (which I don’t typically use, but RX10iv now tracks much better than RX10iii, using “Lock-on AF: Flexible spot M” focus area). By comparison, the 24MP Sony A6500 (16 oz body) looks a tad sharper than both the 21MP Nikon D500 (see dpreview.com) and D7500 in tests using prime lenses. The Nikon 18-300mm 3.5-5.6G captures similar quality to the 18-200mm lenses that I formerly used on Nikon and Sony cameras – lenses which I’ve tested and given up in favor of Sony RX10iii and iv. For travel weight, the 30.3-oz D500 plus 29.3-oz 18-300mm 3.5-5.6G ED weighs 60 ounces, compared to just 37 ounces for Sony RX10iv, which I expect to be sharper edge-to-edge above about 90mm+ equivalent telephoto. Hi! Great article, by the way. I have a a6000 with the 16-50 kit lens, and recently purchased a RX10 I (due to the fact that a 24-200mm was enough for me and I had read great things about the RX10). I’ve done several tests between a6000 with kit lens and the RX10, expecting the RX10 to beat the kit lens of the a6000. The fact is that the RX10 has a good performance from F2.8 to F7. But from F8 onwards the quality starts to decrease serioulsy, and when you reach the F16 the quality plummets. Therefore, I thinkj from my tests, the RX10 is not valid for landscapes because you have low quality picture both in dim light situations and at narrow apertures, when you want that effect of the sun. (and all of this with ISO at 100). Obviously when you have to increase it, the quality goes down, much more severally than in the A6000 (so the RX10 is not valid for milky ways or similar nighty shots). The only aspect in which RX10 bets the A6000 with the 16-50 is a bit the quality in wide apertures and close subjects (and of course the reach of that zoom) as well as the bokeh effects. But, all in all, amazingly the 16-50 is BETTER in low light situations and in F8 onwards… which dissapointed me, since I was expecting the RX10 I to be my high quality all-in-all camera. When using “equivalent apertures” you’ll find that RX10 makes a good lightweight landscape camera, except at night, where A6000’s sensor (3.2 times bigger in area) should be less noisy, especially when compared above base ISO. In its favor, RX10 helps make up the sensor size difference its more efficient BSI sensor design, sharper glass from edge-to-edge, and its lens with brightest aperture f/2.8 being two-thirds of a stop brighter than f/3.5 on your A6000. Both edges and center of RX10 images tend to be sharp compared to soft edges on A6000’s kit 16-50mm lens. RX10 landscape quality is surprisingly good in this portable 8x zoom, except at night (dim light). – On RX10 version 1, about f/4 – f/5.6 is sharpest as you zoom from 24-200mm equivalent. If you use too small of an aperture such as a number higher than f/8 on RX10, diffraction will severely fuzz the image quality; not usually recommended on a 1″ sensor. At the other extreme, the widest aperture tends to introduce chromatic aberrations which decrease image quality. So optimum sharpness for most lenses is usually an aperture of around one or two stops down from brightest aperture. Stopping down even further achieves deeper depth of field, but at the cost of increasingly blurred detail due to diffraction through a smaller hole diameter. – A6000’s APS-C sensor size crop factor = 1.5. So divide f/16 on full frame by 1.5, to get f/11 as A6000’s “equivalent to f/16 on full frame” in terms of actual hole size. – RX10’s 1″ sensor size crop factor = 2.7. So divide f/16 on full frame by 2.7, to get f/5.9 as RX10’s “equivalent to f/16 on full frame” in terms of actual hole size. – f/18.9 on full frame divided by 1.5 is f/12.6 on A6000 to get the same hole size, for same depth of field. – f/18.9 on full frame divided by 2.7 is f/7 on RX10 to get the same hole size, for same depth of field. – f/7.6 on full frame divided by 1.5 is f/5 on A6000 to get the same hole size, for same depth of field. – f/7.6 on full frame divided by 2.7 is f/2.8 on RX10 to get the same hole size, for same depth of field. Thanks reporting your test results. I commend your curiosity. Thank you very much for the quick and complete reply. I did not know about the aperture conversion between 1″ sensor and the APS-C. About that, I’m not sure if, for example, the RX10 at f/7 will have the same depth of field/depth of focus than the a6000 at f/12.6. Anyway, I really wanted to give a use for RX10 at F/16 because I like the sun starbust efect during sunsets, and I feel that with this camera won’t be an option. Actually, I tried to find a good lense for the A6000, but as the only option that seems to beat the kit lens in the prohibitive Zeiss 16-70 I though it it might be more suitable for me to get a good bridge camera as the RX10. I don’t know it the RX10 m3 is better than the RX10 m1, but, I’m afraid that in terms of picture quality there’s no difference, “just” the 200 to 600mm extra zoom, and the slow motion video option. Before thinking of returning the lense I have some days in which I’ll test the lense in more conditions. Meanwhile, there is any proper option for a guy like me, who basically enjoys landscape and nocturne photography, but also portraits. For starburst effects, I suggest getting a star filter (screw-on or handheld square glass) and shooting RX10 at its optimal f/4 (to gather 16 times as much light for better quality than at f/16, minus any losses from the star filter). The starburst at f/16 on my RX10iii is fun to play with, but it makes images extremely soft focus, which lends a more romantic appearance, when appropriate for my intentions for the scene. I own the Zeiss 16-70mm f/4 SEL1670Z on my Sony A6300, which is up to 15% sharper than A6300’s basic kit lens. Zeiss 16-70mm is about 5% sharper than my RX10iii from 16-50mm (24-75mm equivalent) when in direct sunlight, and for closest focus in dim light around 45mm equivalent, but otherwise not. In dim indoor light, RX10iii at its optimal f/4 setting appears about equal in sharpness to SEL1670Z at its optimal f/5.6. I didn’t test night photos, but at ISO 100 on a tripod using optimal aperture, you may not notice a huge difference. I suggest retesting at each camera’s optimal aperture at night. By the way, RX10iii and iv are one-third stop brighter (f/2.4) and slightly sharper than RX10 version i (f/2.8). In England this summer, I only used the A6300 with Zeiss 16-70mm on a tripod at night, but otherwise used RX10iii for everything else from dawn to dusk handheld, a wonderfully powerful all-in-one 25x zoom travel tool, much sharper above 90mm equivalent telephoto when compared to 11x – 15x lens alternatives on APS-C sensor cameras. I am strictly an amateur photographer. I have owned a Nikon D3100 with 18-55 and 55-200 Nikkor VR lenses for many years now and have been very happy. For the most part auto mode is used and I have taken some great photos. I have 2 small kids and it doesn’t matter if it is indoors, outdoors, action, night, etc. I have even gotten some great fireworks pics floating on a boat! My issue is I’m tired of carrying a big bag and swapping lenses when we travel or attend a school event. I also carry a Sony camcorder or a GoPro for video. I purchased a DSC-RX10M3 for the solar eclipse and got some solid pics using auto and -3 EV; however, everyday pics were not as colorful as my Nikon (Sony images seemed rather harsh vs. Nikon or it could be the sensor size?). That said, the Sony satisfied my needs for an all-in-one camera/camcorder. It’s heavy as heck, but it was nice to only have one lens and do video on the fly (wish it could let me take pics while recording like my camcorder). I just couldn’t deal with hunting on long range focus and the output vs. the Nikon. I just saw where the RX10M4 was announced and fixes the long zoom focus, but still can’t get over the image output. It is also a 1″ sensor vs. the APS-C on the Nikon. it got me thinking about the Nikon D5600 with the 18-300 lens. I lose some zoom (I think the conversion works out to 17x vs. 24x on the Sony), the weight is comparable or less, 4K video (not as robust) and the APS-C sensor. Your article does a great job of explaining the difference between the zoom and the 1″ and APS-C sensors and that you recommend the Sony for the full features even with the smaller sensor. I guess I am trying to figure out the difference between the Sony and the Nikon as configured and which would be the best option for me. I have tried a ton of cameras recently and just haven’t found that sweet spot to satisfy all my needs. You have the closest to explaining exactly what I am looking for, but would like some help on comparing these 2 and how they fit in your explanation. This was a perfect article for my needs. I am just not educated enough to really tie down the differences and which would suit my needs for the long term. Any help would be greatly appreciated! Tom replied: While a Nikon with 18-300mm weighs similarly and has nearly the reach, the new RX 10 iv has a much faster f2.4-4 and significantly sharper lens and very fast new hybrid autofocus; all which added together beat APS-C systems overall from wide to tele. The image harshness or color rendition should be fully adjustable in an editor. I always shoot raw format and edit every image. I formerly shot Nikon D5000 and Sony NEX-7 & A6300 all with 18-200 lens. RX10 iii easily beats these, as should version iv RX10. Karl replied: I really liked the versatility of the Sony. I’m just not sure I want to post-process images every time. On a long weekend or at a school event, there could be hundreds of pics to edit. If there was a formula to emulate the color of the Nikon, I could setup a custom setting the camera or in Lightroom and run them all through it. I don’t do much editing or enhancement since I really like the output I get from the Nikon and frankly, just don’t have a lot of time to run through them each time (I have 3500 pics from 2016 and close to 2000 so far in 2017). I guess I really am a point and shoot guy with prosumer/enthusiast taste! Do you know if the RX10 IV will take pictures while recording 4K video? That was probably the best article that explained sensor size and the zoom factor I have read (or could even find that pertained to that subject). I am trying to learn more about the camera world and yours was one of the better ones for any level of user. Tom replied: You should be able to shoot stills while recording video in versions iii and iv, though I have not tried it, and it depends on certain settings. Also note that each 4k frame is already about 8 MP, usable as a still. In Lightroom you can Import a large set of images with preset Development settings, if you want all images to have a given set of adjustments, which I always do specific to each camera, such as medium tone curve, Vibrance, shadows, etc. But in the end it may be hard to exactly duplicate the Nikon jpeg appearance if that is what you prefer. Some cameras let you emulate various JPEG renditions such as resembling film, etc. Go with what works best for your workflow–that may be Nikon systems. Karl replied: You have been more than helpful with this and I really appreciate it. I think I’ll give the RX10 IV a try when it comes out. A lot of people like Canon, or Sony or Nikon and want to emulate the images from one manufacturer to another. I found lots of suggestions for image enhancements to emulate another camera or manufacturer. I’ll play with some of the internal settings as well as try some side by side shots with my current Nikon and the new Sony in Lightroom and see if I can come up with something I like and save that template. I do it for my GoPro already (there is a preset, but it still needs lots of work), so should be pretty easy to do for a higher-end camera. Thank you so much for your suggestions and feedback. First off one of the best explanations on sensor sizes and comps I’ve seen..thank you. I currently have a Canon 6D and Sony A6000. For the 6D I have a number of L lenses but nothing over 105mm in length. For the Sony A6000 I only have the Zeiss 35 2.8mm. Money isn’t a big deal in the equation. 2) 33 oz for 20x zoom 24-480mm equivalent f/2.8–4.5, 20mp 1″ sensor = Panasonic FZ2500. 3) 37 ounces for 25x zoom, 24-600mm equivalent f/2.4-4, 20mp 1″ sensor = Sony RX10 III. Hi, I have a Canon D5ii (50mm 1.4, 70-200 f2.8 and 75-300 f4-5.6). I bit too heavy even carrying two lenses. For Travel would I be better off buying Rx10, Panasonic Fz 2500 or a Canon D7 with 28-105 lens? I am a very quality conscious photographer. What do you recommend? Thanks. In terms of image quality balanced with incredible travel flexibility, RX10 III beats both Panasonic FZ2500 and also Canon 7D with 28-105. With Sony RX10 III you get a sharp 25x zoom weighing just 37 ounces. The Canon EOS 7D (2009, 18mp APS-C) body alone weighs about 32 ounces with battery, plus a 13 oz Canon 28-105mm f/3.5-4.5 lens makes 45 ounces total, for a measly 3.75x zoom. The EOS 7D Mark II (2014, 20mp) is slightly sharper than Mark I, but Sony A6500 or A6300 clearly beats both 7D cameras in resolving fine detail. In the studio tests below, RX10 III’s image quality falls somewhere between the Mark I and Mark II models of a Canon 7D. When you compare wide angle studio scene image quality at http://www.dpreview.com/reviews/sony-alpha-a6500/9 (select Canon 7D, 7D Mark II, and Sony RX10 III from drop down menus) you get equal or sharper results with a lighter-weight Sony A6500 (2016, 24mp) or A6300. The big surprise is that RX10 III performs well in comparison, even pulling ahead to resolve more details than the 7D in the “dim light” studio scene (click the light bulb icon), but is not as crisp as Sony A6500. Bravo for RX10 III’s bright f/2.4 lens (combined with stacked backside illumination sensor technology), which rivals a good PRIME lens presumably used by dpreview on the compared 7D camera. RX10 III roughly matches the D7 Mark II through ISO 800, but adds more noise at 1600+. RX10 III keeps up surprisingly well considering its smaller 1-inch sensor size versus APS-C on the other cameras. My own testing shows that a good 4x f/4 zoom on A6300 (or A6500) is no more than 5% sharper than RX10 III at wide angles in bright light, and is about equal in dim light. At telephoto 5x-25x, RX10 III is much superior to digitally cropping the 4x zoom of APS-C cameras. And for most travelers, adding a bright, heavy zoom tele lens to their APS-C kit doesn’t improve quality sufficiently to beat the lightweight all-in-one solution provided by RX10 III, which is surprisingly sharp throughout 24mm to 600mm equivalent. Tom, …Im looking for a point and shoot camera that can capture as clear detail as possible in the background of the shot (with obstacles), that the shots be easily enlargeable, in lower light (dusk) settings. …The camera i am using now is an Insignia 12 mp. It is decent but i want to try to push the detail up a tad more. And no, im not some creeper…im a paranormal investigator. But i need a slightly better equivalent to the insignia use…they are a great camera but no longer manufactured. I know you might not be a believer, but if you can suggest one. The insignia 12 says on tge lens 5.0-20.2mm EQ 29 — 110mm 1:2.8-6.3 and i believe (not sure) the sensor is a 1/2.3 type. …the Insignia NS-DSC1112 was a great little camera if only a little clunky and slow (However with the sony dsc-w800 i had, i got some decent shots…it also caught some anomalies but the photos were kind of gray overall. The little panasonic lumix dmc-fh24 is a noisy mess of speckled garbage…useless for what I do.) Thanks for allowing me to pick your brain. Sincerely, Kirsten K.
A good next camera for what you describe would be Panasonic FZ1000 or more recent FZ2500. Or if it must fit in a pocket, then try the Panasonic ZS100. These cameras greatly increase your telephoto reach while providing a larger sensor (“1-inch Type”) for sharper details with less noise. Since the flash on most cameras such as these don’t reach beyond 25 to 45 feet or so, you could also consider a larger system with interchangeable lenses and flash mount for more power. Depends on your budget and desire for portability. From the photos shown on your (private) link, I see your camera capturing noisy, smudged detail which has been overly enlarged so the pixels are visible in some cases. The image becomes a Rorschach, open to imagination. We humans look for patterns and naturally anthropomorphize our perceptions. The more detail you capture, possibly the less mysterious the subjects become. Your current camera has served your needs to capture blurred patterns at the limits of its sensor, lens and flash capabilities, but a better camera will extend your range of shooting conditions. How many megapixels in a sufficiently sized sensor, say four thirds, is needed in the camera we are going to buy? 1. Look for most recent year of sensor design or camera production, such as 2015 or 2016, in order to make larger, sharper prints for a given camera size. Look especially for stacked Backside Illumination (BSI) sensor technology, which gathers light much more efficiently by moving wiring to the back so as not to block the light collection buckets (sensels). 2. A larger physical surface area size of the sensor usually beats smaller ones: APS-C sensors capture more light than Four Thirds type; and 4/3 type captures more surface area of light than 1″ Type. 3. However, a lens with fast maximum aperture (such as f/2.4) and larger diameter glass (such as 72mm) with high quality can sometimes beat larger-sensor cameras, as with my 25x zoom Sony RX10 III with 1″ sensor beating the 11x zoom lens on a flagship APS-C camera at most zoom and ISO settings (such as on my Sony A6300, or on 11x-15x zooms on Nikon or Canon DSLRs), especially at telephoto, despite RX10’s smaller 20 megapixels versus 24 mp on APS-C.
Due to many factors, one-on-one field tests under constant conditions are required to distinguish camera quality (or else use the above guidelines). When tiny sensors such as 1/2.5″ type first started to exceed about 8 megapixels, adding more megapixels such as 12 or 16 at first did not increase quality (unless used with a larger lens diameter). As sensor sensitivity improved in later years around 2013-2016, megapixel count again became relevant for making larger, sharper prints in pocket cameras (especially for cameras using new Sony 1-inch Type 20mp sensors). Image quality sometimes roughly coincides with megapixel count for a given physical sensor size, for example: My Samsung Galaxy S6 and Note 5 smartphones with identical 16 megapixel cameras capture images superior to rival Apple iPhone 6s which has 12mp, which in turn is superior to the 8mp camera in earlier iPhone 6. But in general, don’t choose cameras by megapixel count alone. Many thanks for this amazing article gives a lot of insight. I do birding and am always contemplating between far reach of a small sensor vs a larger sensor with BIF [Bird in Flight] / low-light capabilities. What I want to know is, if there a simple matrix ( I know its theory and practical results can be varied) for comparison and conversion. Example: My current kit is a Nikon P900 with its massive zoom and superb IS. Now if I were to say get a 1inch with 400mm micro 4/3 with a 300mm or an APS-C with a 400/500mm. Considering all of them are same MP cameras and F stop is same at the tele end. What would yield a better picture ? Cropping the image to their respective crop factors obviously and consider good light. My experience has always been contrary to what most of “large sensor lovers” mention. This is strictly for super zoom good light pictures. If there were a ready calculator where one can punch in sensor size, lens reach, fstop, ISO etc. and get a “quality” number vs others it would be fantastic, just like graphics and cpu benchmarks. Every time one travels there is a compromise between weight / size, cost and zoom reach, but with so many new cameras coming out its always an effort to find the best fit option. 1. Improving creative photographic skills. 2. Upgrading to the latest sensor technology every 3 to 4 years. 3. Optimizing sensor size between 1″, Four Thirds, or APS-C, to make the camera portable enough to carry everywhere so you don’t miss shots. (But sensors smaller than 1″-Type suffer too much noise in light dimmer than bright sunshine). 4. Using a top lens in terms of large diameter, effective stabilization (IS, VR, OIS, etc or tripod), zoom range, bright/fast aperture and good glass. My field tests of the pocketable 10x zoom Panasonic ZS100 reveal that it is definitely not as sharp as my little Sony RX100 III camera throughout the Sony’s measly 3x zoom; but the Panasonic captures close macro at more zoom settings and more importantly, enormously extends optical telephoto reach from 70-250mm, which overwhelmingly beats digital cropping of the RX100. Both have the same Sony BSI 1″ sensor, albeit different processing software. Also, for sensors having larger surface-area sizes, a given F stop (such as f/4) will have shallower depth of field, affecting image quality; for example portrait photographers and videographers may like very shallow depth of field with subjectively-attractive bokeh. The “equivalent F stop” in terms of comparable depth of field is proportional to crop factor. For example, my Sony RX10 III (37 oz) has a 1″-Type sensor, with 2.7 crop factor compared to full frame. So its f/2.4-4 zoom lens has a “full-frame-equivalent” brightest aperture of f/6.5 at wide angle to f/10.8 (starting at 100mm equivalent) (making it a f/6.5-10.8 equivalent, 24-600mm equivalent lens), giving much greater depth of field than larger-sensor cameras for a given F stop, for potentially sharper bird photography. I use a Sony NEX 6 APS-C sensor size. Shouldn’t I expect a sharper image when using a lens designed for a full frame sensor since I’m using just the center portion of the lens? Less apparent fall off? Just curious. In principle, you might expect a slightly sharper image on an APS-C sensor when using a lens designed for a full frame, but results actually vary, especially when using older film-optimized lenses. In fact, a lens which is designed and optimized specially “for digital, for APS-C” can equal or exceed the quality of an equivalent full-frame lens on the same sensor, while also reducing bulk and weight (in the example further below). Unlike film, digital sensors accept light best when it lands squarely on the sensor rather than at a grazing angle. Digital cameras perform best with lenses optimized specially “for digital”, using “image-space telecentric” designs, in which all the rays land squarely on the sensor (as opposed to having incoming rays emerge at the same angle as they entered, as in a pinhole camera). The light buckets (sensels) on digital sensors require light rays to be more parallel than with film (to enter at close to a 90 degree angle to the sensor). Film can record light at more grazing angles than a digital sensor. Because older film-optimized lenses bend light to hit the sensor at more of a glancing angle, they reduce light-gathering efficiency and cause more vignetting around the edges (which is somewhat mitigated by the image circle being cropped by the APS-C sensor, which uses just the center part of the full-frame lens). DxOMark and other test results show that, while they are both about equally sharp, the Sony 24-240 has more distortion, vignetting and chromatic aberration than the 18-200. The two lenses are both optimized for digital, yet the APS-C lens is much lighter weight and performs roughly equal to or better than the full-frame lens! Video resolution on the Galaxy S3 is smaller than still-image resolution because the high frame rate per second of video would overload its processor. You would need to upgrade to a Galaxy S6 or Note5 to get 4k video (3840×2160 pixels). Dear Tom, I was doing research into a compact camera… Can I please ask your opinion. My requirements are: Variangle Screen / f1.4 – f 2 / 1 cm NFD up to 2 cm for high macro pics / large sensor – the bigger the better / full manual controls / pref ISO 80 or 100. DO NOT want a DSLR as it is to heavy and bulky for me. The main use 95% will be for taking photos of very small Native Orchids in Australia… a dedicated Macro digital camera. Depending upon your desired “large sensor size,” due to physics, the requirements that you listed may not exist within a single given camera. A large sensor generally means large lens and heavier body. Currently, I find that the optimum camera quality in the smallest box is a Sony RX100 version III or IV, good for my macro and great for general photography. With patience focusing using Sony RX100’s tilting LCD with digital magnification, I was able to capture some pleasing shots of tiny wild Calypso Orchids. The head of each tiny purple flower blossom was only about 1 or 2 cm high. Cropping from 20mp down to 7 mp (2360×2897 pixels) nicely magnified to fill the frame, in image #1405WA-398.JPG. 1. I primarily use a Sony NEX 7 camera (24mp, APS-C size sensor, 14 oz body) mounted with 19-oz Sony 18-200mm lens (which is poor for macro but great for a variety of nature travel shots). 2. For backup, portability, and macro, I carry the great Sony RX100 version III (2014, 20mp, 1-inch-Type sensor, 24-70mm equivalent f/1.8-2.8 lens, tilting screen, plus great pop-up viewfinder). It fits in a shirt pocket, and also captures publishable quality! Because its close-focus distance is not exceptional (as close as 1.97″ or 5 cm at wide angle; but 11.81″ or 30 cm focus at telephoto), its 20-megapixel macro images of tiny subjects will need to be cropped so that they look sufficiently magnified. For example, see my Calypso Orchids (above); and also the Nevada flower macro shot (cropped to 1500 x 1000 pixels, but presented on the web at 800 pixels wide) in my article on Sony RX100. Some macro specialists prefer Olympus cameras (like Olympus OM-D E-M5) with Micro Four Thirds size sensor – these camera systems have some excellent choices for macro lenses, some have bodies with tilting screens, and the live view often lets you magnify to attempt good manual focus. For some photographers, a Micro Four Thirds sensor size gives a nice optimum for good macro shots: a depth of field that is deeper and generally sharper than larger sensors, captured on a sensor with sufficient surface area to keep ISO low enough to avoid noisy images while keeping a shutter speed fast enough to prevent blur due to subject motion and hand shake. For close focus/macro magnification, some people like sensors smaller than the RX100’s 1-inch-Type sensor, such as the Panasonic FZ50 (1/1.8″-Type sensor) (described below) or similar successor cameras. A disadvantage of focusing with the lens poking just a few centimeters from the subject is that you may cast a darkening shadow on it (or disturb insect subjects). Larger-sensor systems can usually give you a further working distance from lens to subject (if that is an issue), but at the cost of shallower depth of field, due to the physics of having a larger sensor. Many smaller-sensor cameras require you to shoot at noisy ISO to get a fast enough shutter speed to stop motion of the subject; but luckily the latest Sony sensors in RX100 version III and IV are excellent, controlling noise well, even as high as ISO 800. On the web, you’ll find good photographers choosing all sorts of different size sensors for macro shots. Each system has various advantages and disadvantages. Research what actually works in the field, based upon the practical experiences of yourself and other photographers who are experienced at shooting your type of subjects. Thnk you so much for the reply. What are your views on Canon G3X ? Is it worth the price of 1300 dollars with the EVF and the hood. But currently, the Canon G3X is generally beaten by the competing Panasonic FZ1000. I admit that, when compared to Panasonic FZ1000, the Canon G3X (2015, 26 oz, $1000 + $240 EVF-DC1 viewfinder) has some good advantages including a touchscreen, longer zoom range (24-600mm equivalent) and significantly smaller body. — FZ1000 tilts and swivels (articulates) its LCD, but G3X just tilts. Sony A6000 (12 oz body, ~$630 at B&H) mounted with a Sony 18-200mm lens (27-300mm equivalent, 19 oz, model SEL18200, $800). The A6000’s APS-C sensor has 3 times the light-gathering surface area compared to the 1-inch-Type sensors found in G3X and FZ1000. 24-megapixel images shot with the telephoto end of A6000’s 27-300mm equivalent lens can be cropped to approximate telephoto quality from the smaller-sensor G3X and FZ1000 cameras (which have 20 megapixels, generally captured with lower overall quality). I am also new to photography , and good in painting oil canvasses , so while I am good at composition , my cameras , which I bought recntly because I became a paraplegic due to an accident , I have taken decent pictures with both , but like you have stated m the sharpness, or details seem to be missing at the telephoto end and not so good in low light. I sell my photographs , and people do buy my pictures , but I would like to further improve. Money is always a constraint, but my question is that what I have read so far , btw , I have two sony cameras, HX 300 and HX 60 V, the 1200 zoom on my HX 300 would actually translate to 215 mm on a full frame. Does it mean that 215 on a full frame means the same as 1200 mm on my sony HX 300 ? Thanks a lot in advance ! Thanks for your question. When we speak of “equivalent focal length in terms of full frame”, we’re only referring to the equivalent angle of view captured by the sensor (such as seen through the electronic viewfinder). “Equivalency” lets us compare the angle of view of cameras having different-sized sensors. Perhaps less confusing is to express angle of view in terms of degrees (measured diagonally across the frame), instead of “equivalency” (but comparisons to full-frame 35mm remain a legacy from the hallowed 35mm film era). A zoom lens equivalent to 24mm – 1200mm on a full frame 35mm film camera has a diagonal angle of view of about 84 degrees at wide angle and 2 degrees at longest telephoto (assuming focus is at infinity, image has a 3:2 aspect ratio, and other assumptions). which means that it actually zooms from 4.3mm focal length (at wide angle) to 215 mm (at longest telephoto), with brightest aperture ranging from f/2.8 to f/6.3 as you zoom. Focal length can be thought of as the distance from the sensor to the optical center of the lens. — Panasonic FZ1000 (2014, 29 oz with 16x zoom lens, 1″ type sensor, 25-400mm equivalent). Good luck with your photo sales! …Why would diagonal degrees be of interest to anyone? Do you ever hold the camera diagonally when taking photos? Why not use the horizontal angle? I want to know how wide an area I can capture – especially for multi-shot panoramas. Many fisheye lenses claim 180 degrees – when really they have a horizontal angle of about 140 degrees. Let’s be honest about angle of view. I suspect it is the same mentality that causes us to measure TV screens sizes diagonally?? How USEFUL is that? You’re right that knowing the horizontal lens angle of view for a lens can be practical such as when stitching panoramas with a specified number of degrees. For any lens, the horizontal measurement can be found online (or converted from the diagonal using a mathematical formula). But lens manufacturers have a good reason for reporting lens angle of view as a diagonal measurement when their lenses are used on sensors with different aspect ratios, such as 3:2 and 4:3. A diagonal measurement relates more closely to the size of a lens’ image circle (a fundamental property of a given lens) — so diagonal measurements are normally used to determine “lens equivalence” in terms of angle of view when comparing different formats. When a lens is described as 50mm equivalent (in terms of angle of view measured diagonally), you have a much better idea how similar will be the imaging area when comparing a 4:3 format compact camera with a 3:2 format camera (whereas using a horizontal standard of measurement would mislead in terms of image area and fundamental image circle). Hi, Pulled up your site looking for sensor info..What is your opinion of the Ricoh GR with apsc sensor. I’m new to photography. In the past, Always shot In auto. Thanks. John bresnen. Hi John, thanks for your question about Ricoh GR (released in 2013, 8.64 oz with battery, 16mp, APS-C): The Ricoh GR is a very good specialty camera, generally beating its peers — pocketable cameras having a fast lens with a wide, fixed, non-zooming angle of view and large sensor. In a delightfully compact body weighing less than 9 ounces, it packs a surprisingly large sensor (APS-C) and excellent 18.3mm f/2.8 lens (28mm equivalent angle of view in full-frame-35mm terms), an impressive achievement in miniaturization, good for travel portability. But I personally prefer a more versatile pocket camera with electronic viewfinder and image-stabilized zoom lens such as Sony RX100 version III ($800 at B&H). The RX100 images won’t be quite as sharp at 28mm equivalent compared to Ricoh GR, especially edge-to-edge, but RX100’s versatile stabilized telephoto will be sharper than cropping the wide angle lens of Ricoh GR to reach a telephoto angle of view. A workaround for Ricoh is to move closer to the subject to better fill the frame, which often isn’t possible. Ricoh’s large APS-C sensor becomes superior to RX100’s 1-inch-size sensor at around ISO 800 to 1600 and higher (AUTOmatically invoked in dim light conditions such as dawn, dusk, or indoors), to helpfully reduce image noise for sharper enlargements. – Ricoh GR generally beats competitor Nikon Coolpix A. The pricier Fujifilm X100S ($899 at B&H) has a top-notch viewfinder; but Sony RX100 version III is a better value including good electronic viewfinder (EVF). Both Sony RX100 ver III and Ricoh GR flash have an impressively fast synch speed of 1/2000 sec. – Ricoh GR has no image stabilization and doesn’t shoot very fast continuously (just 4 fps). It’s not good for raw action photography or movie shooting (which has no exposure control). In April 2015, Ricoh GR costs $597 at B&H including Ricoh GV-1 External Viewfinder (but this minimal viewfinder doesn’t indicate focus, and frames inaccurately at less than 6 feet, and adds bulk so camera no longer fits your pocket). A good viewfinder is crucial for photography outdoors in bright sunlight where reflections often obscure LCD screens. – By the way, for just $100 more than Ricoh GR (and twice the weight), instead of a pocketable camera, you could upgrade to a much superior Sony A6000 with 16-50mm Lens (2014, 12 oz + 4 oz 24-75mm equiv zoom, 24mp APS-C) with truly Fast Hybrid Autofocus.